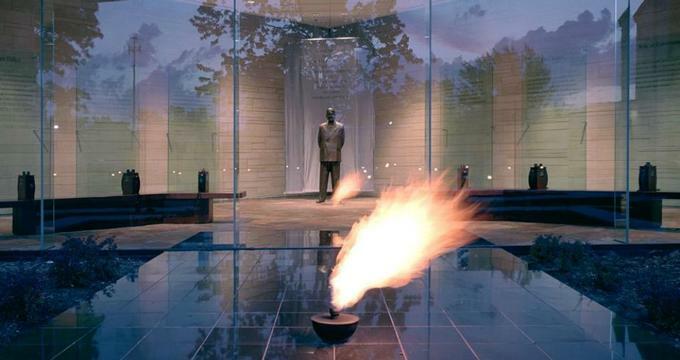 Located right in the heart of Independence, Missouri, is the Harry S. Truman Library and Museum, which chronicles the life, times, and distinguished political career of the 33rd President of the United States of America. Dedicated in July of 1957, this is one of 14 Presidential Libraries in the United States and the first to be created under the Presidential Libraries Act of 1955. It was the second Presidential Library to receive a national designation. Built on a small hill facing US Highway 24, the library and museum showcase the colorful and accomplished years in the public service of President Truman, who was born several miles away from Independence, Missouri. The remains of the president, along those of his wife Bess as well as his daughter and son-in-law,are laid to rest in the courtyard of the museum. There are more than 32,000 objects housed in the museum, including thousands of papers, books, diplomatic gifts, and family possessions of the late president. Visitors will also get to see more than 1,000 letters from President Truman addressed to his wife. Guests will get to take a closer look at President Truman’s two offices. One is the same office he used from 1957 to 1966 and another is a mock-up of his Oval Office. The former is as historical as the latter, as the great Missourian worked there 5 to 6 days a week after finishing his two terms as president. He wrote his book Mr. Citizen and met there with other US presidents, such as Hoover, Kennedy, Johnson, and Nixon. The library is equally interesting, and not just for history buffs and bookworms. It has more than 10,000 books, and about 15 million pages of manuscript materials are in the custody of the library, with nearly half of them classified as White House files. Aside from its extensive manuscript collections, it also has more than 128,000 pictures, 1,000 hours of video tape recordings, and 500 motion pictures. Guests will be greeted by a mural painting titled Independence and the Opening of the West, created by Thomas Hart Benton. Since 1959, more than 13,000 researchers have used the research facilities of the library, including scholars or graduate students as well as students, journalists, filmmakers, writers, and people who are simply interested in the life and career of the distinguished Missourian. Admission to the Harry S. Truman Library and Museum is $8 for adults and $7 for adults over 65 years old. The rate for children aged 6 to 15 years old is discounted at $3, while children under 5 years of age can enter for free.